UN Secretary-General Ban Ki-moon visited the International Centre for Small Hydro Power (ICSHP) in Hangzhou, Zhejiang Province, on July 9, as part of his official visit to China. 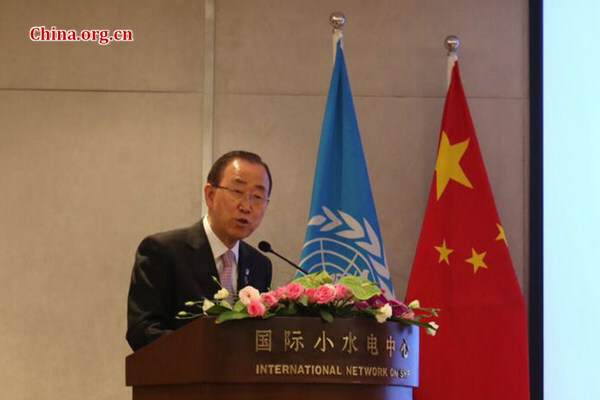 There he acknowledged that South-South cooperation would help achieve the Sustainable Development Goals (SDGs). The ICSHP is a public and non-profit institution in direct affiliation to the UN Industrial Development Organization, China's Ministry of Water Resources and Ministry of Commerce. The center provides technical expertise and capacity buildup for the United Nations Development Programme's (UNDP) Renewable Energy Technology Transfer projects in Ghana and Zambia. The project intends to increase impoverished areas' access to energy through off-grid and community-based power. ICSHP is a key institution for experience sharing and capacity scale-up for countries with an urgent need for clean energy. Ban recognized that the ICSHP and its partners are good examples of how South-South cooperation can help achieve the SDGs. "Innovative trilateral cooperation, such as the Renewable Energy Technology Transfer project, is a good examples of your center's dedication to supporting goal 17 [Partnerships for the goals]," he said. Small hydropower stations are a practical solution to rural electrification as well as poverty alleviation, economic growth and climate change mitigation in developing countries, said Cheng Xialei, chief of the ICSHP. South-South cooperation for climate change and other thematic areas offers a unique opportunity to share China's knowledge with other developing countries, said Patrick Haverman, deputy country director for UNDP China. In other words, it shows that developing countries are helping each other, rather than passively awaiting aid from developed countries to achieve development goals.